The World Needs A Stronger Blog...: "Gee, our old LaSalle ran great." "Gee, our old LaSalle ran great." 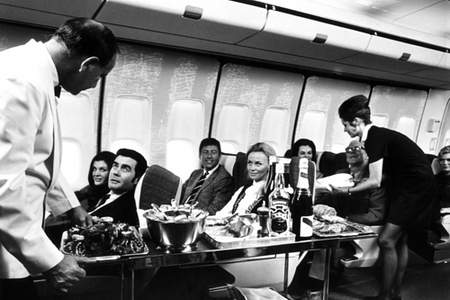 There was once a day when the blondes and Bloody Mary's flowed like the City of Bridges and the only thing higher than the stewardess' skirts were their altitude-defying cheekbones. These days flying is about as glamorous as a trip on the B63. Thankfully I'm not the only one yearning for the glamorous golden age of flying. 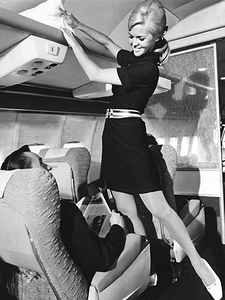 Much of today's air travel nostalgia - such as the Broadway hit revival of "Boeing Boeing" - centers on stewardesses (now called flight attendants) who were often hired for their looks and coquettishness. 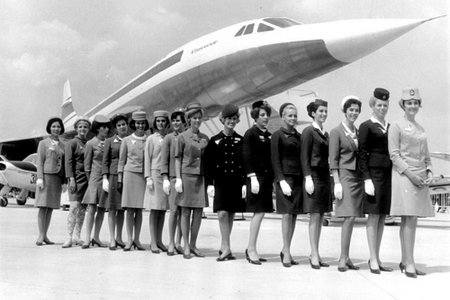 In this 1970 photo, stewardesses pose with a model of the Concorde, the supersonic jet that cut trans-Atlantic crossings to less than 4 hours. I wrote this article on the future of air travel some months ago. The company I highlighted, the decadent Eos, has since folded. Naturally.